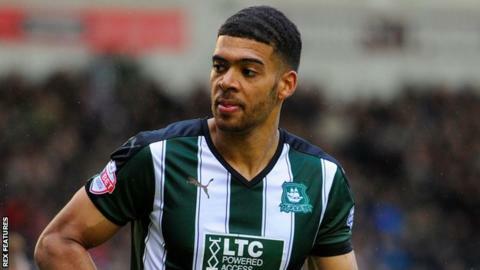 Plymouth Argyle forward Jake Jervis is a "different class", according to defender Peter Hartley. Substitute Jervis scored twice as Argyle won 3-1 at Leyton Orient, a win which saw the Pilgrims move up to fourth place in League Two. "He's basically said to the gaffer: 'Here I am, there's two goals, start me Saturday and I'll score you another two'," said Hartley, who also scored. "It just goes to show the characters we've got in that dressing room." Argyle are level on points with third-placed Oxford United and a point behind second-placed Accrington as they look to end their five-season stay in the fourth tier. "Jake Jervis has been different class," added Hartley. "It's been a long season and people have come in and gone out and I think Jake's been very unlucky to get dropped on to the bench, because I thought he played well against Portsmouth. "But he's come on and scored two goals so it just shows the character of the guy." "The only thing we can control is what happens in that dressing room and on those pitches, so we'll stay focused," he said. "We won't be looking at what other teams are doing, who other teams are playing - all we care about is Dagenham on Saturday and three points after 90 minutes. "If we pick maximum points up I'd like to think we can get automatic promotion."